Wow, Obenjo! That's really cool, especially since the statue is a bust of Kondo. One would think the statue might be just the *head* of Kondo with what it represents! And I also remember reading in the march of the Tengu-To section in Shimazaki's Yoake Mae (Before the Dawn) that a father was carrying the head of his son on the march and asked a local in Nakatsugawa (I think) to bury it in his plot. This is where I drew the idea of the Mito woman carrying the heads of her brothers in my Samurai Fiction story came from. If I recall correctly, I think the head in Shimazaki's work belonged to a fellow named Toshiro. I stumbled across an interesting find while walking down a section of the Tōkaidō that I'd like to share. Located along the old Tōkaidō road, not too far from the Fujikawa shuku (post town) in what was the province of Mikawa, Hōzō-ji temple is famous for two things. The temple first became famous as it was where a young Matsudaira Takechiyo began his early education. This boy would later become Tokugawa Ieyasu, who unified Japan in 1600, and for this reason, it received special patronage from the Tokugawa Bakufu, which Ieyasu established in 1603. Because of this, plus the fact that many of the things that young Ieyasu used where housed there, the temple was a popular place for people to stop at as they traveled this once great road that connected the imperial capital of Kyoto with shogun’s capital of Edo. It was during the fall of the Tokugawa shogunate that Hōzō-ji received yet another item of historical importance—except this time, this was an item that wasn’t interred in the temple’s store-house or hall of worship, but rather the cemetery. Hōzō-ji is the final resting spot for the head of Kondō Isami, leader of the Shinsengumi. The Shinsengumi was a crack security unit of gifted but ruthless pro-shogunate swordsmen whose sole purpose was to help keep the peace in Kyoto at a time when it was being infiltrated by equally dangerous pro-imperial ronin. So in order to rid Kyoto of its pro-imperial thug problem, the Shogunate brought in its own group of thugs—the Shinsengumi—who were very effective at killing, drinking and basically living fast and dying young. In the fighting that marked the collapse of the Shogunate and the ushering in of the Meiji Restoration, Kondō managed to get himself captured. 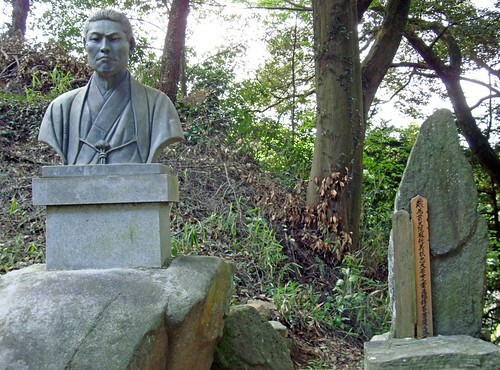 It goes without saying that as leader of the Shinsengumi, he wasn’t the most popular guy with imperial forces, and he was brought to Itabashi in Tokyo, where he was sentenced to death by beheading on April 25, 1868 (Gregorian calendar). Call this a coincidence, but as I am posting this on April 25, 2009, today marks the 141st anniversary of Kondō’s death. Freaky! After Kondō’s head was displayed in public for three days, it was salted and sent to Kyoto where it was re-spiked for public viewing at the Sanjō Bridge. As gruesome as this sounds, this was how things were done back then, but how the head wound up at Hōzō-ji is a mystery. Perhaps a Shinsengumi/Bakufu sympathizer tried to return the head to Kondō’s family that lived close to Tokyo, but gave up along the way. As Hōzō-ji is a Shogunate affiliated temple, it’s kind of fitting that it should be the final resting spot for one of its more infamous supporters. Feel free to check out photos of other historic sites that I've visited at http://www.flickr.com/photos/rekishinotabi/. Tama is a suburb of Tokyo and is a very long way off from Fujikawa/Okazaki. The distance is approximately 185 miles or 298 km. Kondō's headless body was interred in Ryūgen-ji temple in Mitaka, Tokyo. This is where the Kondō family graves are located. Whether or not it was an honest to goodness real member of the Shinsengumi that went back to Kyoto to retrieve Kondō's head, who knows? It could have been a sympathizer or even a courier. The statue is same with the one in Kojima Archives. The Ryozen Museum of Bakumatsu History will be having a special exhibition called "Shinsengumi: Chasing the Light and Shadows" running from August 4 through August 30. Items from the Hakodate Museum as well as from the Tano family's collection will be on display. The sword scars look quite menacing, don't they? Record of Shinsengumi discovered from Nishihongan-ji diary. Dated 1865-6-25, Hijikata Toshizo asked more rooms for Shinsengumi members.